The faith community has so many celebratory times during the course of the year - baptisms, confirmations, events to recognize volunteers, teachers, chancel guild members, Cursillo members, graduating students -- not to mention the high festivals of Christmas, Easter and Pentecost. There are also those occasions in our life journeys that call for a symbol of faith to encourage and support us through the challenges; through the times of bereavement, illness, the transitions that catch us by surprise. And, there are those times to celebrate the people in our lives - our mothers and grandmothers, our fathers and grandfathers, special friends who have been guardian angels in so many ways. We are pleased to offer the Transformation Cross with a prayer card for these and other specific occasions. You can purchase one at the regular price of $10 or save when you buy in larger quantities. You can mix and match as you wish. 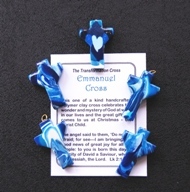 And, at the bulk price of $5 per cross they make a great fundraising item! We can include a silk cord for a nominal charge of $10 per 25 pieces. Need a quantity not listed below? All Crosses come on an attractive card with an inspirational prayer specific to the theme, in a clear sealed package. Military, Emergency workers, Medical Staff etc. - Teacher - Welcome to the new term. With affirming blessing prayer. 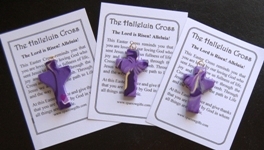 The Transformation Cross is available individually for $10 each. Because we believe they can be a blessing to so many people, we are offering the crosses at a special bulk rate to groups, parishes, schools and organizations. We are offering these beautiful crosses at a bulk rate of only $5 per piece with a minimum order of 25 crosses! Whether you use them as a graduation present, teacher or volunteer appreciation gift, or as a fundraiser item (see school or parish pages), you get the benefit of a fabulous price for a quality product! We are a small business and so request payment in full at the time of your order. If you are ordering with a Purchase Order, we can make special arrangements so that you can get your order quickly. We do accept electronic money orders and VISA and Mastercard over the phone. You can also order online at the website using Paypal. Please allow at least 2 weeks for delivery, depending on the speed of the postal services. Orders in Canada are send via Expresspost. Those groups who are in the GTA and Niagara area are welcome to pick their order up. Choice of Brown, White, Rainbow, burgundy or Madonna Blue. Call us at 905-468-9502 to place your order with a VISA, Mastercard or by email money transfer.